Prime Minister Stephen Harper says “tremendous economic opportunity” lies in tapping Canada’s northern resources, describing it as a key to the country’s prosperity. The comments came in a press conference in the Yukon, which he visited as part of his seventh annual Northern Tour. The tour, which runs from August 20-24, is part of a long-term drive by the federal government to facilitate the development of resource projects in Canada. 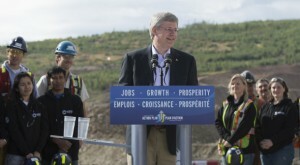 The Prime Minister said the Canadian economy can outperform that of the United States, Japan and Europe by continuing to exploit its vast natural resources, much of which lies untapped in the North, and that there are more than 500 new development projects, worth half a trillion dollars, being proposed in the country over the next decade. The Canadian economy is heavily reliant on natural resources, with $142.5 billion or 11.5 percent of Canada’s gross domestic product (GDP), and a staggering $200 billion in export revenue, amounting to over 50 percent of the net worth of all Canadian exports, being produced by the country’s resource sectors each year. The announcement of a new Federal Skilled Trades Program (FSTP) last week by the Department of Immigration was largely a reaction to the growing demand for skilled workers like welders, boiler makers and heavy equipment operators in resource extraction hubs, particularly in western provinces like Alberta, as the country’s energy and mineral sectors have boomed, and ageing workers in the skilled trades have begun to retire in greater numbers.